There’s already a pretty robust weekly tournament schedule at Americas Cardroom, but sometimes the site juices things up a bit with its Online Super Series (OSS). Guaranteeing millions of dollars in prizes, this recurring series brings to the online arena some of the excitement of popular offline poker tours, like the WSOP, EPT and WPT. Each Online Super Series runs for about two weeks. The Online Super Series contains dozens of events at a wide range of buyin levels. There are usually some tourneys that cost less than $5 to enter as well as a few that require the payment of hundreds of dollars. No Limit Texas Hold’em accounts for the bulk of the schedule, as you would expect, but there are typically a smattering of PLO and PLO/8 events. While they’re not featured at every instance of the OSS, leaderboard competitions are provided from time to time. Some of the prizes that they have awarded to the best series performaers are cash, prize packages to the Punta Cana Poker Classic and sterling silver bracelets. Although some OSS events probably fit easily within your bankroll, others might be too expensive for your tastes. Fortunately, you can enter satellites for most of these tournaments and thereby win your ticket for a reduced price. 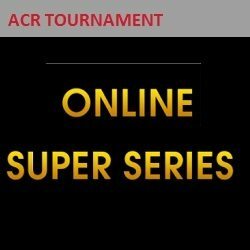 Read up on how to open your ACR account in our Americas Cardroom bonus code review, and then you’ll be able to participate in the Online Super Series and all other poker events offered by the company. Big money awaits you if you sign up at ACR here!